This year’s Fairelands Hunt – the Lost Land – sends you on a search for the Ten Champions chosen by the Bard Queen to mentor, protect and instruct her daughter, the Princess Flora. Each day the Faire is running, we will be introducing you to a different Champion. They all have stories to tell … and some of these may give you clues to help you find them! Razia was the daughter of a great Moghul sultan and his favourite wife, who was not only a woman of great beauty but also, secretly, a deva, one of the race of benevolent supernatural beings who are constantly at war with their power-hungry rivals, the asuras. His wife concealed this from the sultan, whose faith was different from hers, but when she discovered that she was with child, she prayed to her gods that the child she bore might be a warrior, an archer as famed as Arjuna. At the same time, her husband prayed that the child would possess all the gifts of the arts so beloved by the Moghuls in their beautiful palaces and gardens. In their different ways, both parents dreamed of producing a great ruler for the land. But what both parents neglected to pray for was a son. 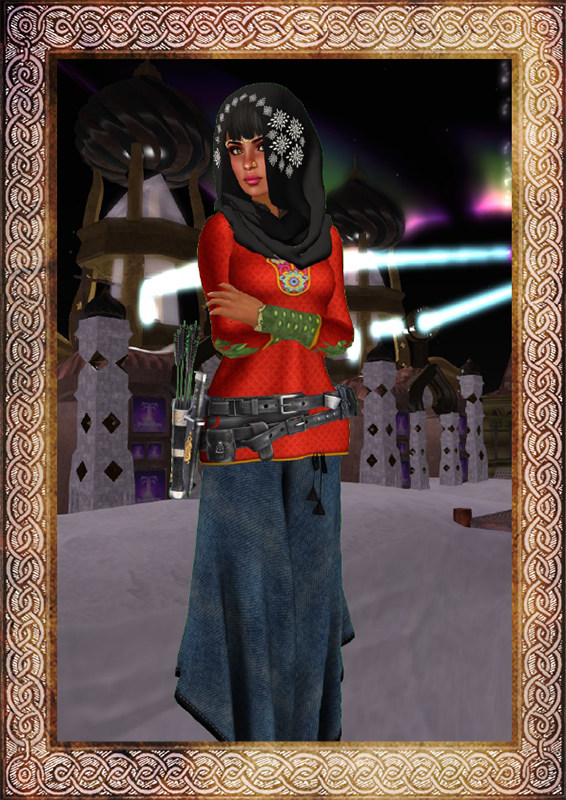 And so Razia was born, with all the grace and beauty of her mother, and the artistic soul that her father desired. But as she grew, it became clear that she was as skilled with a bow as she was with a brush. Perhaps in skill she never surpassed the legendary Arjuna, but certainly she was as famous as he in the kingdom for it was rare to see a woman who could use the bow not only in feats of skill but also from the back of a horse and from a war chariot. Gifted by her supernatural mother, her talents clearly outweighed that of her half-brothers. She proved a skilled and brave opponent in battle, and more than once led the charge and put to flight the enemies of the land. As a result, much to the alarm of the court (but to the delight of the common people, who greatly loved their unusual princess), her father named her his heir. But he was prudent and aware that no untried girl would be accepted by his ministers and the powerful lords of his court. So he sent her to the court of the Bard Queen to further her training, in the knowledge that such training would, when the time for her to reign came, prove invaluable. The Bard Queen, swiftly recognising the qualities of Razia, not only welcomed her to her Court, but also appointed her one of the Champions of the Princess Flora. You can also read this page as part of an online book here. Previous PostPurchase Spirit of Fantasy Faire in Real Life!Next PostSo much Faire, so little time!